Mary Loretta Landrieu is an American politician and former U.S. Senator from the state of Louisiana. She is a member of the Democratic Party. Mary Loretta Landrieu (/ˈlændruː/ LAN-drew; born November 23, 1955) is an American politician and former U.S. Senator from the state of Louisiana. She is a member of the Democratic Party. 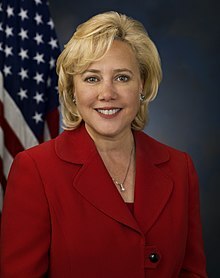 Born in Arlington, Virginia, Landrieu was raised in New Orleans, Louisiana. She is the daughter of Moon Landrieu, former New Orleans mayor and Secretary of the United States Department of Housing and Urban Development, and the sister of Mitch Landrieu, the current Mayor of New Orleans and former Lieutenant Governor of Louisiana. She received her baccalaureate degree from Louisiana State University in Baton Rouge. After working as a real estate agent for several years, she was elected as a state representative (1980–1988) and state treasurer (1988–1996). She won a close race for the U.S. Senate in 1996; she was re-elected by increasing margins in competitive races in 2002 and 2008, but lost in 2014.